My encounter with Vernon Lee is inextricably intermeshed with the various episodes of my work on Henry James and his circle. In my quest for turn-of-the-century, liminal artists and writers, each step inevitably led me towards Vernon Lee. 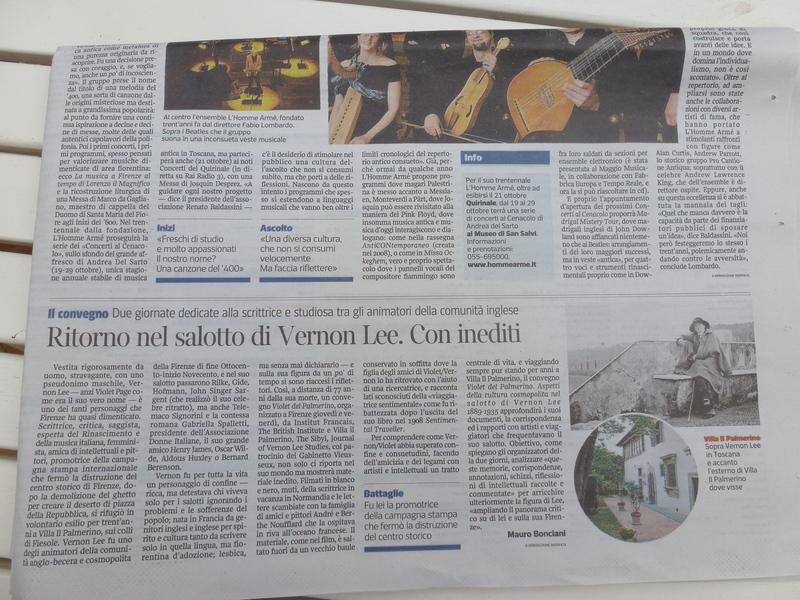 One of the most extraordinary instances of this interrelation occurred in January 2001 and again in January 2002, when, in the course of an extended research work about Vernon Lee’s musical texts, I came across eleven James letters at the villa of Vernon Lee’s neighbour in Fiesole (Italy), Bernard Berenson’s famous Villa I Tatti. Looking for Vernon Lee’s models for her uncanny portraits of weird musici (i.e. castratro singers of the eighteenth century in Italy), I had been searching through various archival funds, libraries and museums around the world, from the National Portrait Gallery of Victoria in Melbourne, to Stuttgart Museum, to the Bibliothèque Nationale in Paris, the British Library in London, the Museo Civico Bibliograficale Musicale in Bologna, and, naturally, the extraordinary Biblioteca Marucelliana and Biblioteca Nazionale Centrale in Florence. Florence where she, one of the most acclaimed and sought after literary lionesses in the cosmopolitan colony of British and American distinguished expatriates, died on February 13th 1935. 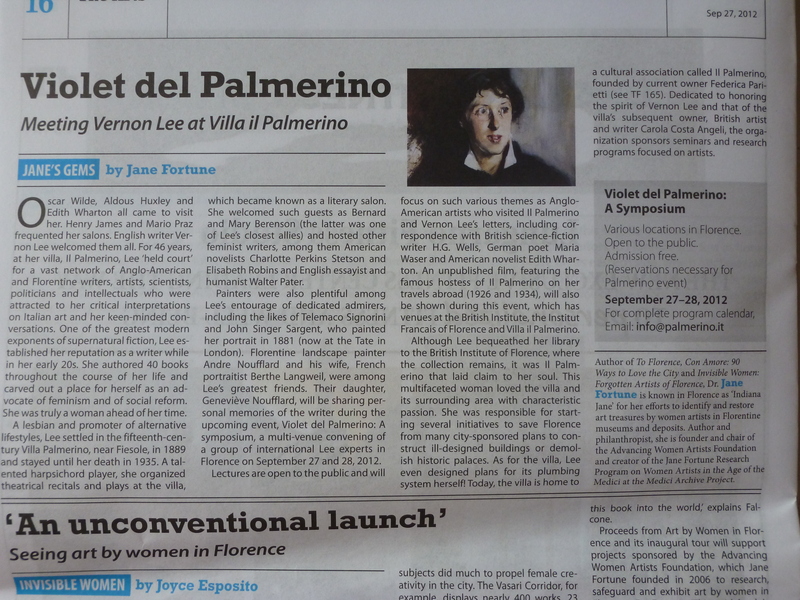 It is to the current owners of V. Lee’s villa Il Palmerino at Maiano, who allowed me to take some pictures of the house, and kindly drove me to the Villa I Tatti, that I owe the unexpected discovery of these James letters. For this, as well as for keeping up the memory of Violet Paget, and attending to her hitherto anonymous tomb in the Cimitero Evangelico Agli Allori, I am forever grateful to the families Angeli, Paretti, and Biancanelli. The superb Villa I Tatti, Bernard and Mary Berensons’ home, has become a private foundation which now houses the Harvard University Center for Italian Renaissance Studies. 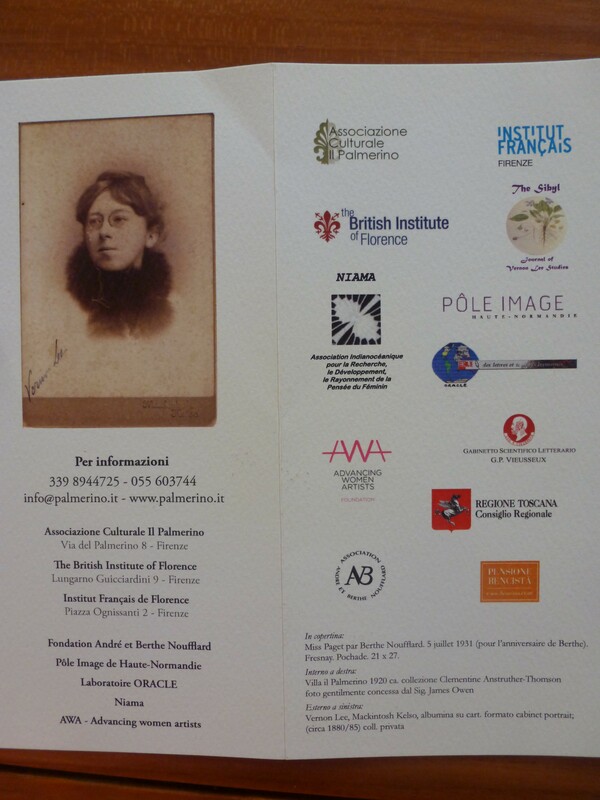 There, in January 2001, I was given access to five letters signed “Henry James”, and a year later, in January 2002, back in Florence to double check on the Henry James letters, six more letters were shown to me; they were signed “William James,” had been addressed to various members of the Berenson family, and evidenced one outstanding fact: the friendly connection between the Jameses and the Berensons spanned three generations at least and was part of their families’ history. There were also sensitive documents mentioning Violet Paget and her friend, Clementina (Kit) Anstruther-Thomson, as well as Lee’s original manuscripts. And I could hardly suppress an overwhelming surge of emotion at handling original Lee manuscript letters and scraps of papers. In this hushed atmosphere, merely to touch these with white-gloved, tremulous hands was enough to make one uncannily feel “as if she might come in:” this conjuring up the ghost of the sibyl was indeed “The Real Thing,” as Henry James would have said. It certainly gave one the strong sense of the lifelong intellectual ties and trans-generational and transatlantic friendship between the James and the Berenson families; and Vernon Lee, who was a close friend of Mary’s, was part of this network. This microcosm was brought together by family ties and friendly feelings, and welded together by a community of interests: letters and arts; literary creation; the “new psychology”, especially its explanations as to the human response to aesthetic objects; ghosts, mysticism, religions and the sub-conscious; and, generally speaking, all the contemporary controversies about scientific discoveries or politics (e.g. the Dreyfus “affaire”). Vernon Lee’s friend, Mary (Smith Costelloe, then Berenson), appears as the keystone of this monument to friendship. Mary often spent the weekend at Villa Il Palmerino, while Vernon Lee felt at home at Friday’s Hill with Mary’s family in England. 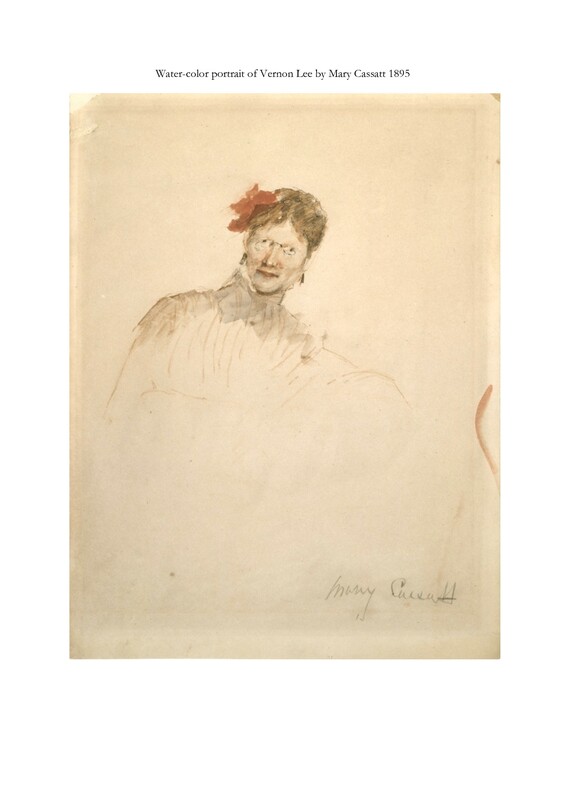 A remarkable woman by all standards, Mary, who was the friend of Walt Whitman, predicted women’s suffrage as inevitable, was the author of “A Word to Overworked Women”, lectured about “The Position of Women in America”, and campaigned for her husband’s stand for parliament. With her ideas verging on socialism and Fabianism, she was the embodiment of the liberated “New Woman.” Her personal collection of books and papers at I Tatti includes William James’s letters to her father, Robert Pearsall Smith, and the numerous books which Frederic W. H. Myers had offered and inscribed to William James, his lifelong friend and SPR (Society for Psychical Research) associate, which evidences Mary’s interests in otherworldly matters. One can catch a glimpse of the other expatriate artists and novelists at whose houses they were regularly invited: indeed, the list of Lee’s correspondents and friends reads like a “Bottin mondain”: the Jameses, Walter Pater, Oscar Wilde, Carlo Placci, Robert Browning, George Bernard Shaw, Aldous Huxley, Bertrand Russell, Mario Praz, Constance Fenimore Woolson (Henry James’s devoted friend); Lady Brooke, the Ranee of Sarawak, H. G. Wells, Maurice Baring, and many others. They were all knit together by the intellectual and the aesthetic pursuits they shared and those they rebelled against; a strong sense of companionship made up for their uprootedness as cosmopolitans. It undoubtedly provided them with the sense of belonging to a network of sympathies across the Atlantic and across the ages. May The Sibyl, which started thanks to David C. Rose just after the first Vernon Lee Conference (organized in London, 10 June 2003, by Patricia Pulham and Catherine Maxwell), be a tribute to their work and mirror their/our galaxy of worthy friends! This was to be published in La voix maudite, Rennes : Terre de Brume, 2000. A critical edition and translation into French from Vernon Lee by Sophie Geoffroy-Menoux. Lee quoted in Irene Cooper Willis, preface to Vernon Lee’s Letters, London: Privately Printed, 1937, p. xii. Cooper Willis, op. cit., p. x.
 Ernest Samuels, Bernard Berenson, the Making of a Connoisseur, Cambridge, Mass. & London: Belknap Press of Harvard University Press, 1979, p. 255. Philip Horne, HJ: A Life in Letters, UK : Penguin Books, 1999, p. 189. In 1869, Margaret Brooke, née Windt (1849-1936), had married Sir Charles Brooke, the famous Rajah of Sarawak (North East of Borneo). She was a close friend of Henry James’s, B. Berenson’s and Vernon Lee’s.